A specialist active dried vodka distiller's yeast. 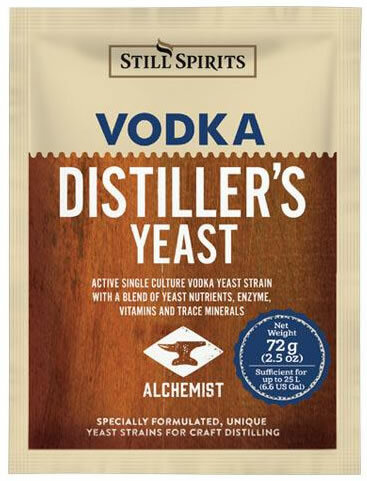 Vodka Distillers Yeast - A specialist active dried vodka distiller's yeast. This has a unique low congener profile for vodka spirit and gives excellent sugar to ethanol conversion, thus maximizing the yield. The strain is highly viable, ensuring a short lag phase and reduced risk of bacteria infection. Suitable for making 25 L (6.6 US Gal) of spirit. NOTE: Distiller's Yeasts are designed for use when making spirit in the more traditional way, i.e. potato.